Already from a young age, a small boy, Pablo, began to paint some details on his father’s paintings, and a year later he wrote a more adult work with the name Picador. Further, the formation of Picasso, as an artist, was impetuous. After graduating brilliantly from the Royal Academy of Fine Arts in Madrid, he comes to Paris and visits various exhibitions and museums there almost daily, studying the paintings of the great Velasquez, El Greco and Goya. An important role in his work played a great interest in the works of Delacroix, Van Gogh and Gauguin. Having experienced the influence of impressionism, he already at the age of 20 acquires an individual style of writing, and Paris impresses him so much that in 1904 he permanently moves here. At the end of 1901, Pablo turned to a new range of painting – blue and cold blue tones. Upon his return to Barcelona, ​​the artist begins a blue period, and he writes his main masterpieces. In the paintings of the “blue” period, accents of blue color and its shades prevail. However, this is not the only feature of his work. At this time, the individuality of the artist is most clearly expressed. If in the first canvases traces of post-impressionism and impressionism, as well as academicism were traced, then the subsequent works are fundamentally new in genre. An image is already more clearly expressed, everything superfluous is removed from the composition, and only the main thing remains that reveals the author’s intention, conveying his emotional state. 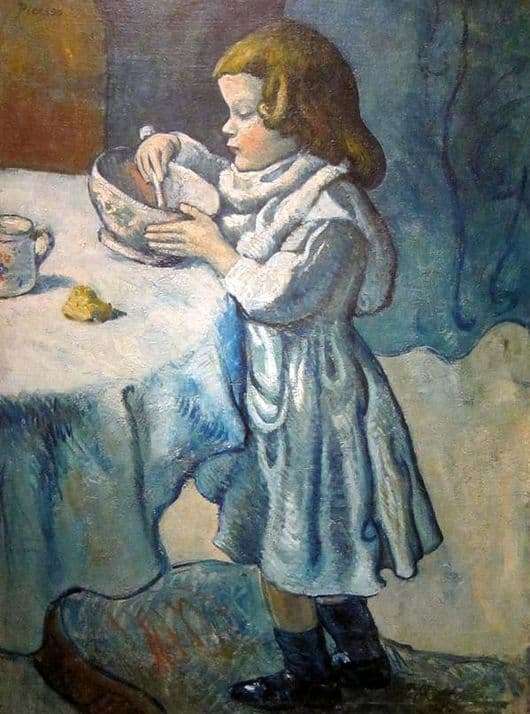 The painting “Gourmet” depicts a sad child, perhaps from a poor family, who eats the last drop of soup and a small piece of bread. In addition to these dishes, apparently, he has nothing more to eat. In the paintings of the “blue period” the artist vividly expresses the themes of old age, death, poverty and melancholy. Sadness is the real link of this period. He portrays saddened and suffering people.